The 9-2 loss was Lightning’s largest home defeat in their Elite League history and the biggest on their own ice since they were downed 11-3 by Swindon Wildcats in December 2014 during their English Premier League days. The losing run eclipsed the seven straight losses which preceded the departure of coach Doug McKay in November – that in itself was a record. The one saving grace for Lightning was that Giants did not even move into top gear for more than 10 minutes – had they done so the result would have been far worse. It was akin to Premier League Manchester City’s recent 9-0 demolition of League One Burton Albion in the EFL Cup. Few home fans could have been expecting anything other than a loss against a Belfast team experienced in European competition and chasing Cardiff Devils for the Elite League. Indeed anything less than a six goal defeat may have been regarded as a victory – unfortunately even that was too optimistic. Little blame can be placed at the hands of Lightning’s players – they battled hard but it was men against boys with Belfast’s giant budget allowing them to recruit most of their players from North America’s second and third tier leagues. Indeed some have years of NHL experience. In contrast MK’s are mainly from the lower competitions over the pond. The writing was on the wall – or should that be ice – as early as the second minute when Darcy Murphy slotted in from the left after being set up by Dustin Johner. There was a moment for home fans to celebrate as Georgs Golovkovs fired in to the right of back up netminder Stephen Murphy on the powerplay at 12mins 15secs. But the visitors were back in front by the second break – thanks to a slashing penalty on Harry Ferguson that gave Belfast a powerplay from which Murphy bagged his second goal after 17mins 54secs. 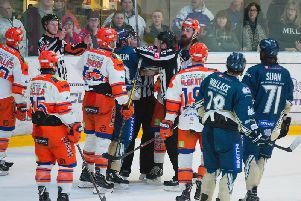 The shots on goal tally for the first period gave a clue to Giants’ dominance – 21-7 in their favour, a statistic which was even worse in the middle session at 23-3. For much of the second period Belfast were able to defend in the neutral zone, their goalie virtually a spectator as Lightning failed to progress past the defensive blue line more than twice in the first 10 minutes. If it was a damage limitation exercise by the hosts after Belfast scored their third through Patrick Dwyer within 18 seconds of the restart it was not clear. However if it was it did not work completely with defenceman Josh Roach blasting from the blue line through traffic to make it 4-1 with a shot that pinged off the left pipe at 35mins 3secs. And after Michael Fine was penalised for hooking late on, Roach caught out goalie Patrick Killeen again with a long range effort to extend the lead to four goals at 39mins 7secs. MK’s defence was cut apart again when Darcy Murphy went up the left and fed Blair Riley to defeat Killeen on 45mins 13secs. After Jonathan Boxill made it 7-1 with a shot which seemed to take a deflection on 47mins 53secs Killeen had had enough and was replaced by back-up goalie Adam Goss. By this stage Lightning had not had a single shot on goal in the third session but they finally did so when Golovkovs and Tim Wallace went on an unsuccessful raid. However, the deficit grew when Chris Higgins made an interception and was allowed to dance his way through the home defence to beat Goss at 53mins 55secs. Although Fine, set up by Lannon was able to cut the gap with the hosts’ second goal at 54mins 9secs it was soon cancelled out as Boxill, aided by Great Britain veteran, Colin Shields, registered a scrappy ninth goal for Giants. While it was a night to forget for Lightning it was also one when lots of lessons would have been learned about what is needed to even try to compete against the top Elite League outfits. The latest defeat followed a 2-0 loss to former coach Peter Russell’s Glasgow Clan at Planet Ice three days earlier. In that game Lightning conceded to a Craig Peacock goal after just 2mins 13secs. Although they were in with a chance of retrieving the score they rarely looked like doing so – Clan wrapping up the game with a Zack Fitzgerald strike after 56mins 4secs.